The arrest of three males for a break and enter into a north Nanaimo home late Saturday night has lead to the discovery of a large number of items stolen from boats moored in local marinas in the past week. The investigation began when officers attended to the 5000 block of Leslie Crescent shortly after midnight after astute neighbors reported seeing several males dressed in black taking items from a neighbors home. Police quickly converged on the area and based on evidence obtained and with the assistance of Police Dog Services, attended to a nearby Hammond Bay Road and arrested three males for the incident. The items taken from the Leslie Crescent home were later located which included a computer, electronics and jewelry. A search warrant was then obtained and the home searched. “As is often the case in police work, members located a number of other stolen items in the home believed to have been taken from boats moored in local marina’s in the past week” said Constable Gary O’Brien, media spokesperson for the Nanaimo RCMP. 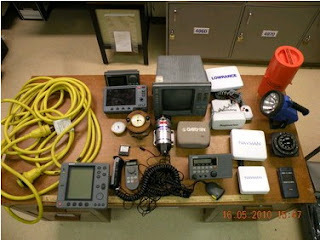 Seized from the home were nautical electronics( fish finders, tracking devices, Garmans) designed specifically for boats. Officers will be attempting to contact persons who had their boats broken into and are asking the public to refrain from contacting them. Brody and William MILE age 18 and 19 respectively, have been remanded into custody and face charges of Break and Enter, Possession of Stolen Property and Theft under $5000. Brody Mile also faces one additional charge for Breaching his Recognizance for being out past his curfew. The third male ,age 16, was released from custody and faces the same charges as the MILE brothers. He will be making his first court appearance in Nanaimo Provincial court on June 3rd. All are from Nanaimo. “The MILE’s are linked to at least five other files relating to break ins and thefts from local marina’s. It is believed at least two stolen boats, one of which was sunk in the process, were used in the thefts to gain entry to the marina’s from the water and gain access to boats. “ Thefts from boats are on the rise. Knowing this and recognizing more and more boats are gearing up for a season of boating , now would be a great time for boat owners to assess their own security features and talk to their marina management about ways to reduce further incidents” said O’Brien. The Nanaimo RCMP offers Harbor Watch as a safety measure for boat owners. It involves trained volunteers traveling by boat keeping a watchful eye on boats moored in local marina’s. If you are looking for information on this service, please contact the Community Policing Section of the Nanaimo RCMP at 250-755-3257. Brody needs more than home schooling, he was linked about a month back to almost $10,000 worth of stolen music gear in port alberni, but here he is wandering the streets. how do you release somebody on their own recognasence, when he obviously has no problem stealing anything that is not bolted down & chained. gotta love our (lack of) justice system. If you ask me, the kid needs to have his hands removed.